Most of the Northwest Coast art in my townhouse is in the formline style favored by the Northern First Nations in British Columbia. However, I am always willing to learn more about other coastal traditions, and slowly that’s what I’m doing. The only trouble is, relatively little is written about these other traditions, so most of my knowledge comes from looking at what working artists like Kelly Robinson are doing. Robinson is a young artist of mixed Nuxalk and Nu-chah-nulth descent who is exploring both sides of his ancestry. 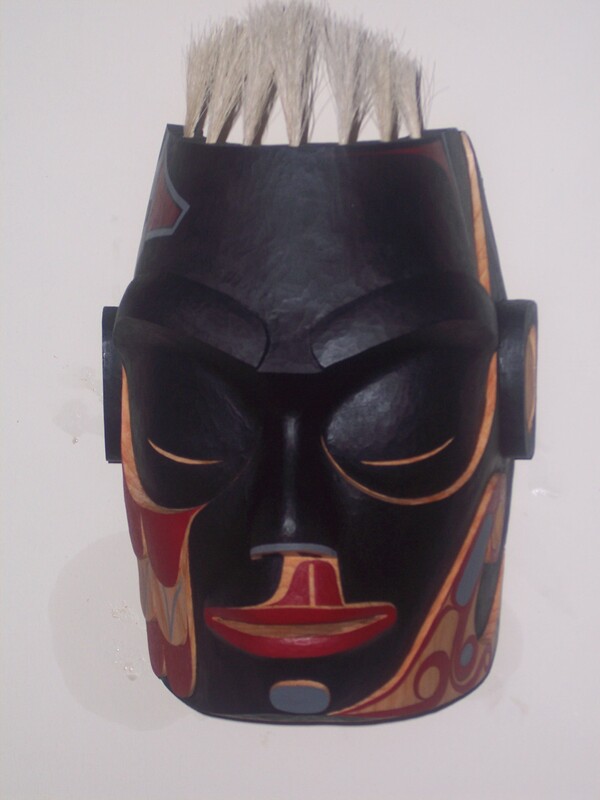 In the last year or so, much of his wood carving (he is also an accomplished jeweler) has explored Nu-chah-nulth forms. In particular, he has built on the work of artists like Joe David and Art Thompson who revived the tradition and elevating it into fine art based on his time at the Freda Diesing School. Fortunately for me, “Ancestor of Today” became available when I had just cashed a few cheques from editors. I first saw the mask in Cathedral Close, the garden outside the Bill Reid Gallery in downtown Vancouver, and, a couple of hours later, I was taking it home on the Skytrain in a bag I was clutching in a death-grip. The inhabitants of the west of Vancouver Island, the Nu-chah-nulth (formerly called the Nootka and the West Coast) were in a position to be influenced by both the Kwakwaka’wakw, Nuxalk, and Heiltsuk to the east, and the Haida to the north. In fact, unlike most first nations around them, by 1900, Nu-chah-nulth had at least two different styles, a newer one based on formline, and the older, original style. There also seems to have been a third style reserved for the curtains used in the ceremonial mysteries, although I am not altogether certain. At any rate, these mixed influences may explain the mixture found on “Ancestor of Today.” On the one hand, the mask includes elements that are universal in the coastal traditions, including the U-shapes and the labret that indicates high status. The hair, too, is arranged in a buzz-cut that I have seen in works from every nation. On the other hand, the facial features all seem to me to be typically Nu-chah-nulth origin, from the raised eyebrows to the high forehead and the nose that swells around the nostril. One of the strongest distinguishing features are the outsized, shallow eye sockets. Unlike in the northern style, the eyes themselves are barely distinguished from the sockets. Here, they are no more than crescents indicate a closed eye, although they would probably not be much more detailed if the eyes were open. The eye sockets join the high cheekbones – another distinguishing feature – not in a plane, as in a northern style, but in a single line. The painting, too, differs strongly from the northern style. The traditional red and black are the primary colors, but, they cover most of the mask, rather than being used only to highlight features like the lips, nostrils, and brows. Moreover, instead of the designs being painted across the face without much regard for the carving, the way they would be in the north, the designs on the bottom of the cheeks are on their own planes. Between the lips and the nostrils, a different approach is taken, with the inverted U-shape merging into the top list, and the unpainted border on each side of it into the nostrils. The overall impression is of a simpler, bolder style than would be likely to come out of the north. It is enhanced by the slightly rough knife-finish – Robinson’s first effort at this technique, he tells me. To my modern eye, the closed eyes give it Buddha-like sense of calm dignity in keeping with the mask’s name, which asserts a claim that the tradition is still alive and evolving today. I admire Robinson’s Nuxalk style work, especially the “Four Carpenters” and “Mother of Mischief” paintings, which hang in my living room. However, his Nu-chah-nulth work has its own fascination, especially since he is one of the few artists in the tradition who is trying to evolve the tradition. With “Ancestor of Today,” he manages the difficult trick of re-introducing the tradition while adding first-rate finishing and the steady hand on the paint brush that modern buyers expect. I’m looking forward to what he does next in this style. - Christina Rossetti, "The Goblin Market"
The idea of the goblin market haunts me. Whether in the form of Christina Rossetti’s poem or the faery market in Neil Gaiman’s Sandman, it seems to me a place where anything can be found among its motley booths and awnings – a place anything can happen and anyone can be encountered, where promise and nightmare meet, and you can never be quite sure which is which. That is why I can never resist a farmers’ market, and will even get up early on a Saturday to visit one. True, these markets are pallid reflections of the goblin market. Many of the half dozen or so that have sprung up around the Vancouver area in the last five years are already starting to have all the same booths, so that they sometimes seem to be rapidly devolving into outdoor shopping malls. All the same, they continue to fascinate. An evolutionary psychologist might claim they appeal to the hunter-gatherer in us all, a Jungian that they evoke an archetype reinforced by school fairs and music festivals, a partial holiday from routine. Foodies, no doubt, are attracted by their wish for the organic and a locally produced diet. Nor can I deny that’s part of the appeal. Show me fresh cloves of garlic, or multiple species of tomatoes of different shapes and colors that were on the vine a few hours ago, and my curiosity and intermittent sense that I should be eating better immediately get the better of me. Promise me alternative strains of corn bred for tastes other than sweetness, and I want to decide for myself how different they are. Show me an artisan displaying belts or handmade canes, and I have to slow to look. Never mind that, at least half the time, my palate is too unrefined to detect enough difference to make the effort and extra cost worthwhile. Never mind that almost none of the artisans forge or cast their wares. I can tell myself that I’m too gullible and that next time I need to be more discerning in my efforts to separate the true from the false – and next week, I will be as careless as ever in my purchases. Part of what makes a farmers’ market so irresistible is the personal touch. Maybe some people can trudge up and down the lines of booths without talking to those staffing them, but I” m not one of them (perhaps I need to get out more). I can’t just get out my wallet. Instead, before I buy, I find myself asking about what I’m buying, maybe passing a disparaging remark or two about what’s usually available in the supermarkets, and asking questions about small businesses that are now in their second or third generation. Then, ten or fifteen minutes later, I’m at another booth, starting a similar conversation. The experience is as far from the exchange of “How are you?” at the checkout stand as it could possibly be. But the major appeal comes from the fact that even the worst farmers’ market offers alternatives. Most of these alternatives are not radical, but they are just different enough to trigger impulse buying – something I rarely allow myself, thanks to habits required in my days of poverty. Usually, I approach a market in much the same way as I would a casino: I give myself a spending limit of, say, $100, and stop buying when it’s gone. Often, that’s an easy habit to keep, because most vendors are not equipped to handle credit or debit cards, and I’m restricted to the cash I’m covering. My habit is to circle the market once, then return to the booths I’ve marked for closer attention. What I buy remains remarkably consistent, too, generally consisting of random fresh vegetables and cheeses and various organic or at least artisanal foodstuffs. Bantam corn, consisting of ears about eighteen centimeters long and four in diameter, promised by the vendor to be less sweet than most modern variants. I would have gone on to see what the organic beef, chicken, and fish sellers were offering, but at this point I had spent my quota. Strictly speaking, these purchases put a serious dent in my monthly food budget. But, by a rationalizing sleight of hand, I counted them as part of my discretionary funds. Of the items on this list, only the normal sized corn was actually on this week’s grocery list, but I know that I will enjoy all of them, sooner or later. Then, sooner or later, when they are gone (or possibly a bit before), I will be headed to another farmers’ market, just as eager to beguiled and to buy with a child’s impulsivity as ever before, sure that, if I just look hard enough, I will find fresh moly salad or unicorn flank steak, just waiting for me to try. I consider myself pro-feminist. I was one of the first professional journalists to talk about sexism in free software, and I make a point of mentioning newsworthy women whenever possible. However, my position does not mean that I support every argument in its favor. I am particularly hesitant about the argument that free software is missing something if its developers are mostly male, and that having a more equitable proportion of women will automatically make free software better. The idea is probably true in the sense that more women in free software means more developers. Perhaps, too, more testing with female users might affect usability to a degree. But unless I’m mistaken, the people making this claim mean more than that. Without actually saying so, they seem to be hinting that there is a female sensibility or perspective that is currently missing in free software. That seems a valid argument in literature or other arts, but I can’t help suspecting that there are only so many use-cases in software development, and that few – if any – are related to gender. The argument isn’t helped by the vagueness with which it always seems to be made. How, exactly, does a database become better because a larger percentage of woman wrote its code? How might more women improve the features of a word processor? I am ready to consider such arguments, but, aside from an issue with name changes in Git, I have never heard any made except in the most general terms. The main exception, as Anita Sarkeesian continues to document, is video games – but games fall into the category of story-telling, in which gender issues are self-evident. Anyway, the argument has been made at least a couple of times before. Some suffragettes claimed that giving women the vote would eliminate war and poverty – a claim that we now know to be untrue. Eco-feminists made similar claims about innate nurturing tendencies a couple of decades ago, but their arguments from alleged evolutionary fact are no more solid than the biological arguments that misogynists use to prove female inferiority. As Cordelia Fine relates in the wonderfully titled Delusions of Gender, the differences between male and female intellectual capacity are simply too minimal for them to be taken seriously. Given a coding project to a group composed entirely of women, and statistically the result is as likely to be as satisfying – or as messed up – as what is produced by an all-male group. However, my real objection to the argument is the fact it is utilitarian, which seems a dangerous way to argue what comes down to a matter or rights. The trouble with a utilitarian argument in such matters is that, at least in theory, it can work both ways. For instance, when the question of women serving in combat is raised, most of the arguments against the idea claim to be firmly grounded in the practical. The claims are made, for instance, that women lack the necessary strength, or that male soldiers would be distracted by their wish to protect their female peers. Yet even if these claims were true – and I believe they are not – would that stop anyone insisting that women should have the chance to serve in combat? I know that it would not change my opinion. In the same way, women’s greater participation in free software is a right, a possibility that should be open to any woman who proves her competence. It seems to me that to lose sight of that basic fact is to risk being distracted by arguments that can just as easily work against the cause as for it. Argue that everyone deserves a chance, that everyone should be able to fulfill their potential – but don’t argue that the result will be noticeably different in other ways, because the odds are that it won’t be. When I was a teaching assistant and sessional instructor, I spent a lot of time worrying about fairness in my marking. I didn’t have much problem at the start of a semester, because I hadn’t put names and faces together. However, by the second and third week, I knew all the students, and how they behaved in class would start affecting how I marked their essays. Those I liked would get the benefit of the doubt, while I could never be sure if I was marking fairly those who disrupted their classes or skipped them. Worrying about such biases, I came up with an obvious but effective way of making marking fairer that I believe would also go a long way towards increasing the gender and ethnic diversity in hiring. My solution was simple: early in the semester, I distributed a formatting guide. Besides the usual suggestions for font selection and citation methods, and a suggestion that students should not waste their time adjusting margins and fonts to fit each assignment’s page count, I asked students to provide a title page. I asked that the title page include their name and contact information, but no other part of the assignment. When students submitted papers, I asked that the title pages be folded back. In this way, I had no idea whose paper I was marking, and could feel confident that I was marking the contents alone. Only after I had assigned a grade and made a final comment did I turn to the title page so I could enter the grade in my mark book. I pride myself on fairness, and the ability to put personalities aside when considering an issue. Yet the first times I marked blindly, some of my worst suspicions about myself were confirmed. Before I started marking blindly, by the semester’s second or third assignment, I often would save certain student’s work to cheer me up after a dismal run of papers, or put off marking another student’s work because I knew it would likely challenge my patience. Naturally, my expectations tended to be confirmed, although if I had the time (which I rarely did), I would check the best and the worst and sometimes change my marks. However, after marking blindly, I would often be surprised by the results. The students I judged as talented were still at the top of the class, but often their ranking was lower. Similarly, the students I disliked sometimes ranked higher than before. But the real difference was in the middle. Students I had little sense of because they rarely contributed in class almost always received higher marks when I marked blindly – occasionally, as much as two or three grades higher. Even more so than the students at the extreme, I had been short changing those in the middle, due entirely to my personal reactions or perhaps their lack of social skills. What I had been doing was no different from what other instructors were doing. In fact, in the department common room, I regularly heard professors and instructors exchanging stories about students. Sometimes, they even spoke with vindictive glee about how they would punish students with bad marks. I had generally keep aloof from such discussions, but now I was forced to admit that my sole saving grace was that I believed I should try to be fair. Too many of the other department members didn’t seem to care about fairness at all. In fact, some tenured professors seemed to regard punitive marking as one of the perqs of their position. One even marked me down in a grad seminar because he had a longstanding feud with my mother, who lived near him. When I described my efforts to mark blindly, these professors were surprised that I would take such concerns for people who only students, after all. All I knew for sure was that marking blindly made living with myself much easier. I was proud of the procedure, and, having discovered it, inevitably followed it. Years later, I learned that I was not the only person to make such a discovery. I remember seeing one study in which the number of women in orchestras rose considerably when auditioners could hear the music, but not see the musician. Why, I wonder, should employment policies not be required to be similarly blind? Obviously, a time comes when interviewers have to see the job candidates face to face. But we regularly hear that male or English-sounding names have an advantage in the initial screenings, so resumes, at least, could be screened blindly. I can easily imagine other procedures, such as one person doing the interview and the decision-maker reading the transcripts. But such steps, although fairer, would make the arduous process of hirer harder yet, and perhaps are not essential. After all, it is the initial selection that seems to be the main bottleneck for women and minorities. Discrimination is much easier when exercised against a name than a person on the other side of the table, and many women and minority members acquit themselves well enough in interviews if they can only get one in the first place. In fact, I sometimes think that blind assessment would accomplish as much as affirmative action, but with less resentment. Arguments can be made against affirmative action, although I believe that I can disprove them. But what can anyone say about procedures that are fairer for everyone? Give everyone the chance to be judged on their accomplishments rather than their background, and equal hiring practices might follow naturally and unobtrusively. Whenever business is slow, the local businesses who rent out benches post ads that read something like, “You’ve just proved advertising works,” with their contact information below. The ads never fail to evoke a small moue of annoyance in me. My reaction has nothing to do with being caught out. I’m reacting more to the childish glee of the comment. The implication seems to be that someone has been arguing with me, and I have been expressing doubts that advertising works. But if anything is more annoying than someone assuming that they know my thoughts on a subject, it’s someone assuming they know and getting it wrong. Having done ad design, I have no doubt that advertising can work. Like many people in marketing, I may be inclined to mutter that only ten percent of marketing works, and that the trouble is that we don’t know what ten percent that happens to be, but I am certain that it can. Anyway, the assertion isn’t true. I haven’t read the ad because advertising works. I read it because, seeing English characters, I am constitutionally unable not to read them. It doesn’t matter whether the characters are an ad, a Biblical verse, a line of poetry or the first lines of a novel – as soon as I see it, I’ve read it. Probably, I have more control over my breathing than I do over whether I read anything. It’s no credit to any power of advertising that I’m a print addict. Even more importantly, getting noticed is only half of marketing. Successful marketing makes viewers want to take action – to buy, if possible, but at least to know more so they can decide to buy. Since the contact information is in a smaller typeface and hard to read in passing, I’m guessing that these ads don’t prove marketing effective. Even if someone might be interested in renting a bench, they are unlikely to notice whom to contact – and, if other people are the least bit like me, their annoyance will keep most far from the world of bench advertising as they can possible manage.